This guide focuses on the intellectual skills that enable one to analyze anything one might think about - questions, problems, disciplines, subjects, etc. It provides the common denominator between all forms of analysis. 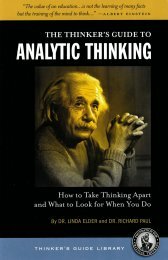 Why a Guide on Analytic Thinking? Analysis and evaluation are recognized as crucial skills for all students to master. And for good reason. These skills are required in learning any significant body of content in a non-trivial way. There are many varieties of analysis specific to particular disciplines and technical practices. These forms of analysis often require technical training of a specialized nature. For example, one cannot do qualitative analysis in chemistry without instruction in chemistry. What we have provided in this guide, however, is the common denominator between all forms of analysis because all forms require thoughtful application and all thought presupposes the elements of thought. For example, one cannot think analytically FOR NO PURPOSE. Or think analytically, with NO QUESTION in mind. In order to develop the analytic mind, there must be guidance, instruction, and practice in monitoring thinking using intellectual tools applicable to every discipline. Everyone needs to learn to question purposes, goals, problem definitions, information, concepts, etc. It is these interdisciplinary analytic tools that enable those skilled in them to understand and assess their analytic thinking, whether in a highly technical area or in an everyday personal application. It is these analytic tools that enable one to get at the most fundamental logic of any discipline, subject, problem, or issue. They provide the means for transfer of learning between and among subjects and disciplines. They enable motivated persons to gain an overview of their learning in any and every situation analyzed, to think their way into and out of various intellectual domains. This thinker’s guide serves as a launching pad toward analytic proficiency.